A photo of Penn State’s Katsutoshi Naito and George Francis Kershner of the U.S. Naval Academy hangs on the wall of a dining room at Annapolis. After 10 years of retirement, I don’t get many “questions for the archivist” anymore, but I had an unexpected one not too long ago. My wife and a group of friends from the University Women’s Club were touring the campus of the U.S. Naval Academy in Annapolis, Maryland. Lunch had been arranged in a private dining room in Bancroft Hall. The walls were adorned with pictures of famous “Middie” athletes of the past. But one old picture caught their attention. It showed two wrestlers; one had “Penn State” displayed across his singlet, and he appeared to be of Asian descent. There was a little flurry of interest and several on the tour wondered who he could be, and if my wife could ask me to identify him. Thanks to the ubiquity of texting, I soon had a copy of the picture in hand. 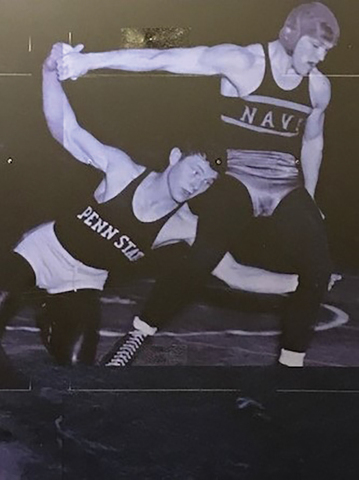 I seemed to recall that Penn State did have a wrestler of Asian background back in the 1920s, but who was it and how did he come to be on the wall of a dining room at Annapolis? A bit of online archival digging soon identified him as Katsutoshi Naito, a native of Hiroshima, Japan, who came to Penn State and earned a bachelor’s degree in horticulture. La Vie indicated his only student activity was being a member of the wrestling team. In 1923, he was one of seven wrestlers and competed in the 135-pounds class. Penn State had a 4-3 dual meet record, and Naito did well. He pinned his opponent in the match against the University of Virginia where, according to the Collegian, his opponent was “unable to solve the Japanese grappler’s style.” The Lions placed second in the Eastern Intercollegiate championship competition that year, one point behind Cornell. Naito earned second place in his class in the Intercollegiates. On the 1924 team, Naito was elected captain, and, at 135 pounds, was one among three individual Eastern Intercollegiate champions with Penn State winning the team title. Penn State won five of six dual meets that year, with the Navy match ending in a tie. And this is where our photo likely comes in. A Collegian story about the 1924 meet with Navy reported that the Penn State captain, Naito, wrestled the Navy captain Kershner to a draw. Penn State won the first match, Navy the last, and all four in between were draws. At that time no points were given for draws, so the match ended deadlocked at 3-3. Except for this draw, Naito was undefeated in the 1924 season. Although the Naval Academy could not definitively identify a picture from an individual match from almost a hundred years ago, it seems clear that the Penn State wrestler was Naito. Stacie Michaud, assistant athletic director and sports information head for wrestling at the Naval Academy, was able to tell me that, assuming it was the 1924 meet, the Navy wrestler would have been George Francis Kershner, of the Class of 1925. He retired as a commander and, while she had no more details on his subsequent naval career, he would likely have been about 37 years old at the start of World War II. That might simply be the end of a curious story of an international student at Penn State, perhaps the first to come from Japan, who becomes a varsity athlete, and whose picture ends up on the wall of a Naval Academy dining room. But the Katsutoshi Naito story went beyond that. In April of 1924, the Collegian reported that captain Naito had been picked to represent his country in that summer’s Olympic Games. After Naito’s win at the Intercollegiates, the Japanese ambassador in Washington wired Penn State President John Martin Thomas to say that the Japanese Physical Education Society had selected Naito to wrestle for Japan in Paris. The Collegian article further noted, Naito was expected to graduate in horticulture in June and would leave immediately for Paris after commencement. All the American wrestlers were college men, but being well-acquainted with the American collegiate wrestling style, he was expected to do well. Even though Japan had only three wrestlers at the Paris Olympics, and despite having injured his fingers in practice aboard the ship to France, he won a bronze medal in the featherweight class. It was Japan’s only medal at the 1924 Olympics, and the first medal ever won by a Japanese athlete in an Olympic Games. After the Olympics, Naito returned to Japan. He tried introducing wrestling to his country, but it could not compete with the popularity of Judo. In 1928, Naito emigrated to Brazil where he started his own horticulture business. He died in 1969 but is remembered for introducing both judo and kendo to Brazil. Thanks to the University Women’s Club’s question, we’ve found another Olympic link for Penn State as we look forward to the 2020 summer games in Tokyo. Lee Stout is librarian emeritus, special collections, for Penn State. Lee Stout is Librarian Emeritus, Special Collections for Penn State.